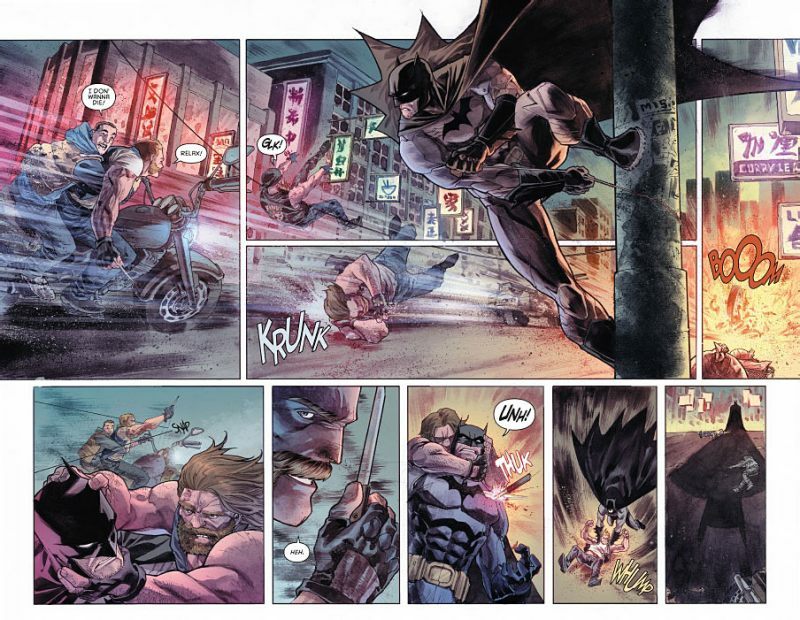 With so many on-going monthly series in the DC Comics New 52 universe, it’s sometimes difficult to find an entry point into the DC Comics titles because of continuing story arcs. If you’ve dumped one or more titles and want to get back in, where do you start? 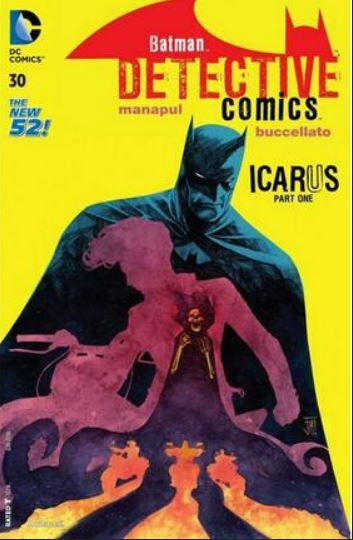 One entry point for you may be Detective Comics, Issue #30, the beginning of a new story arc titled “Icarus.” In this first chapter we don’t learn what Icarus is, but we do meet up with an interesting Batman, moving on past the death of son Damian. We also meet Elena Aguila and her daughter Annie, a motorbike daredevil who looks like she’s cut out to be the next Robin. Similar to one of the main story threads in the Arrow TV series, Elena and Bruce Wayne are forging an alliance to restore the welfare of the citizens in the community of Gotham’s East End Waterfront District. Replacing Wayne’s plans to commercially develop that area of town, and the likely deals with businessmen in Gotham City that he is going to need to cancel to do it, will no doubt create some enemies for Wayne in the process. 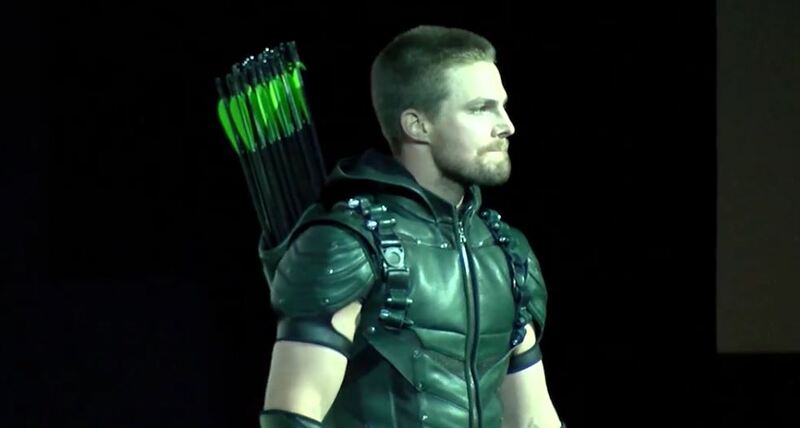 Oliver Queen is dying, out in the desert, left for dead and we don’t know why. Jeff Lemire takes us back three weeks to Seattle to understand what led to this moment. 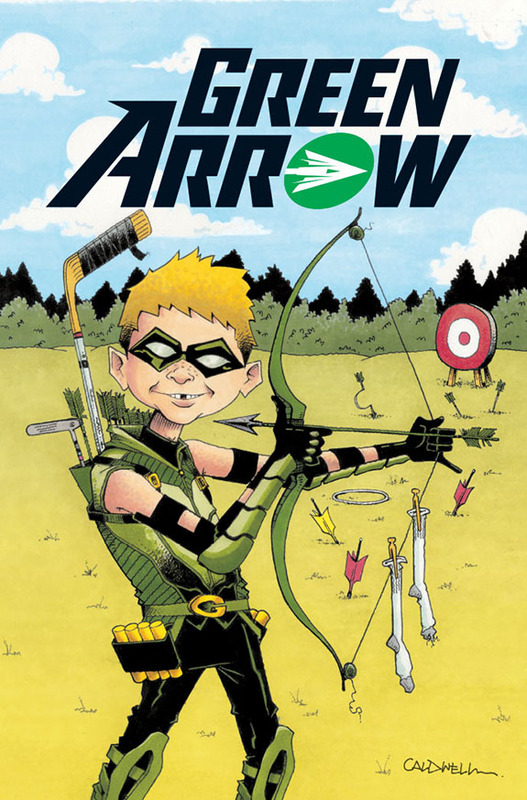 From Lemire’s first issue writing for Green Arrow to today, he has given us an entirely new Green Arrow, and although he chose to keep the trick arrows, not a lot of characteristics would make the new angry young man familiar to long-time fans. 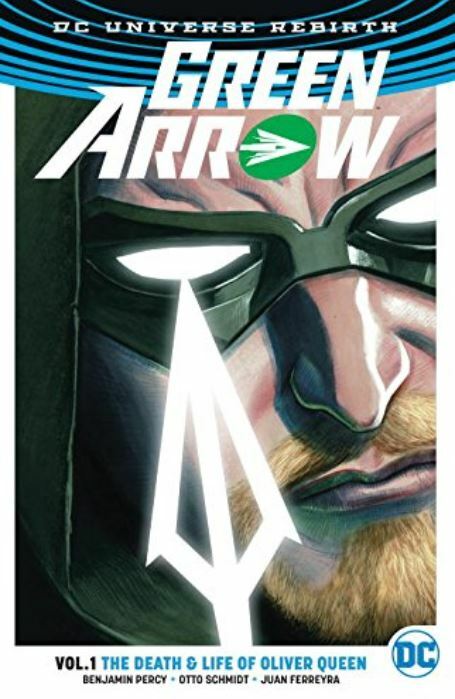 Over the last ten issues, 2013 has seen what the New 52 sees as Oliver Queen. In the five-issue story arc titled “The Kill Machine,” a mysterious hunter, also an archer, called Komodo has destroyed Queen’s life, causing his business and friends to be taken away. Komodo brings along his psychopath of a daughter, too—think Hit Girl and Big Daddy or Boba and Jango and you’ll get the idea. Komodo even has the image projected to him of an even badder bad guy a la the Emperor called Golgotha. Queen has been set up—Oliver Queen is a wanted man for the murder of the leader of the old Queen Industries. Lemire then pulls us back into the history of Queen’s father, his friend, and that island where Queen was stranded for years. Like the ghost of Obi-Wan, a spirit guide of sorts called Magus is trying to steer Oliver on the path away from destruction, to the truth. And going along with the Star Wars metaphors, Oliver confronts Komodo to learn the truth about his father. Sexual assault, child abuse, gay-bashing, drugs, prostitution, armed robbery, biogenic weapons, and street gangs–what dealt with all of these subjects in its opening chapters? 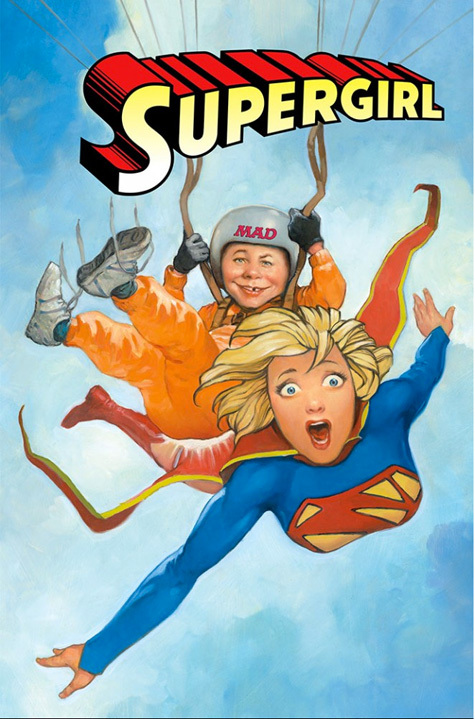 A comic book series? 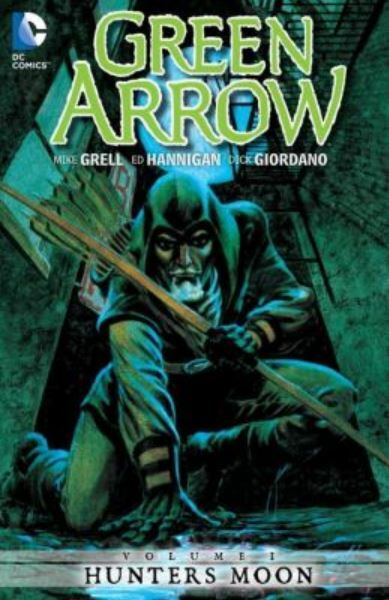 DC Comics is finally compiling Mike Grell’s definitive Green Arrow comic book series that began in February 1988 and ran for more than a decade to November 1998. 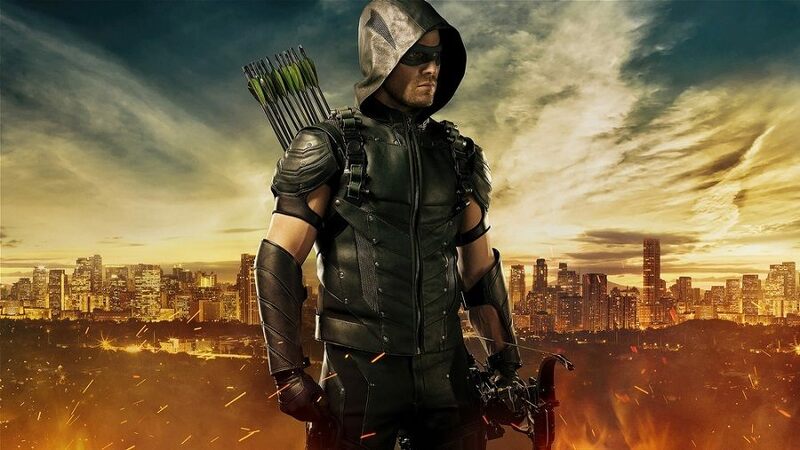 Gritty and real, it’s the Oliver Queen fans cheered for as he cleaned up the streets of not Star City or Starling City, but the dark alleys of Seattle, Washington. 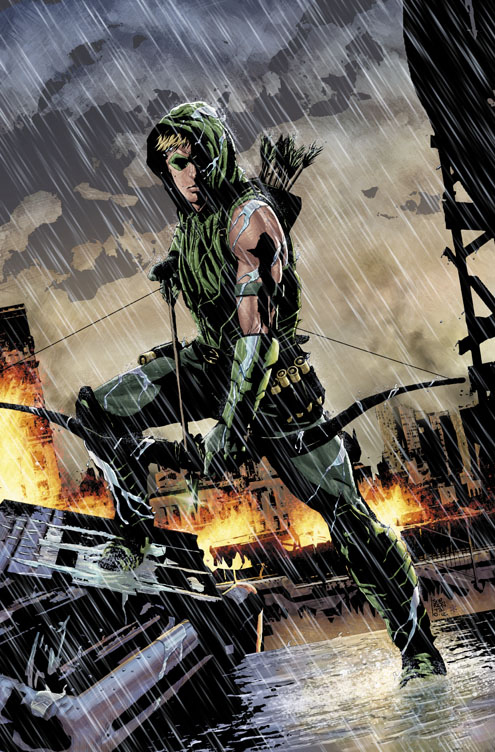 Except for Morton Weisinger and George Papp who created Green Arrow in 1941, and Denny O’Neill and Neal Adams who re-imagined the character nearly thirty years later, Mike Grell did more than anyone to define the urban archer for the ages. Grell actually took over after O’Neill and Adams created their landmark Green Lantern/Green Arrow series in the early 1970s. 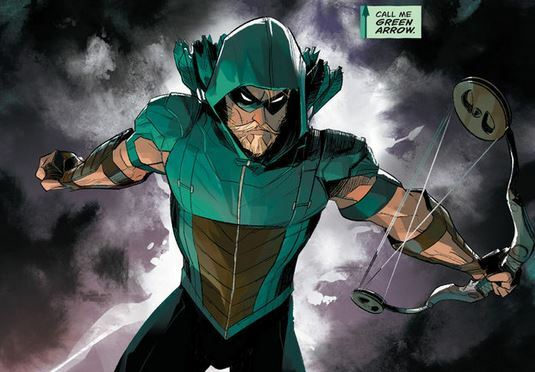 But he made Green Arrow his own with 1987’s Green Arrow: The Longbow Hunters, a three-issue mini-series that finally awakened DC Comics to the potential of Green Arrow and his long-time girlfriend Black Canary. In 1988 Grell made Oliver Queen throw away his trick arrows and use penetrating broadheads that actually killed the bad guys. 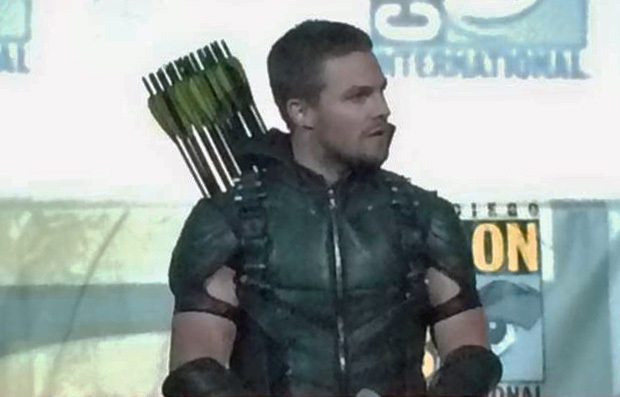 And in none of the storylines was Queen ever referred to as Green Arrow, a component maintained in CW’s Arrow series. Fresh off their writing and art projects from New 52’s Batgirl and Green Arrow, DC Comics creators Gail Simone and Freddie Williams II are bringing real-world politics “Occupy Wall Street” style this May in their new monthly series The Movement. When those who are sworn to protect us abuse their power, when toxic government calls down super-human lackeys to force order upon the populace... finally, there is a force, a citizen's army, to push order BACK. We are your neighbors. We are your workers. And we are your children. Win. Count us in. 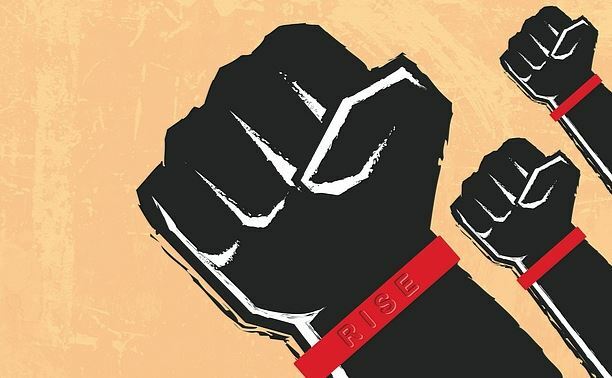 Where do we buy the RISE bracelets? 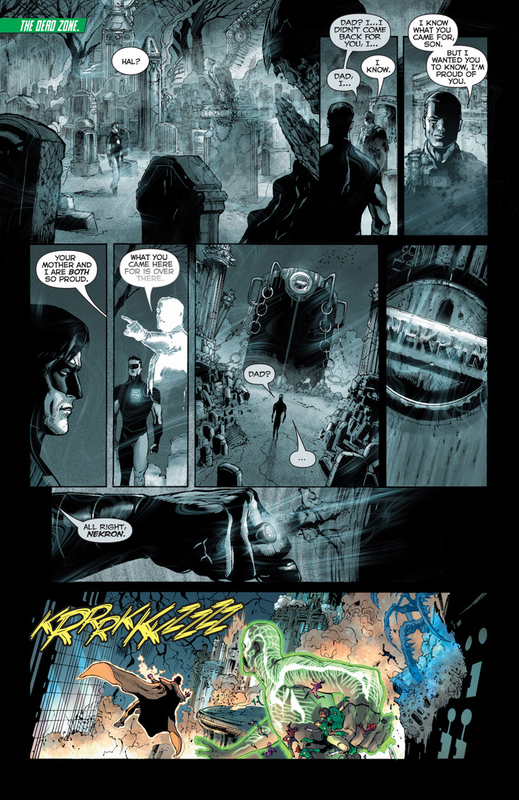 As someone who bailed a few issues into Scott Snyder and Greg Capullo’s Batman: The Court of Owls story arc in the monthly Batman comic book which spanned the bulk of the first year of the New 52, I found that I really enjoyed the crossover follow-on story as compiled in the late February hardcover release, Batman: Night of the Owls . 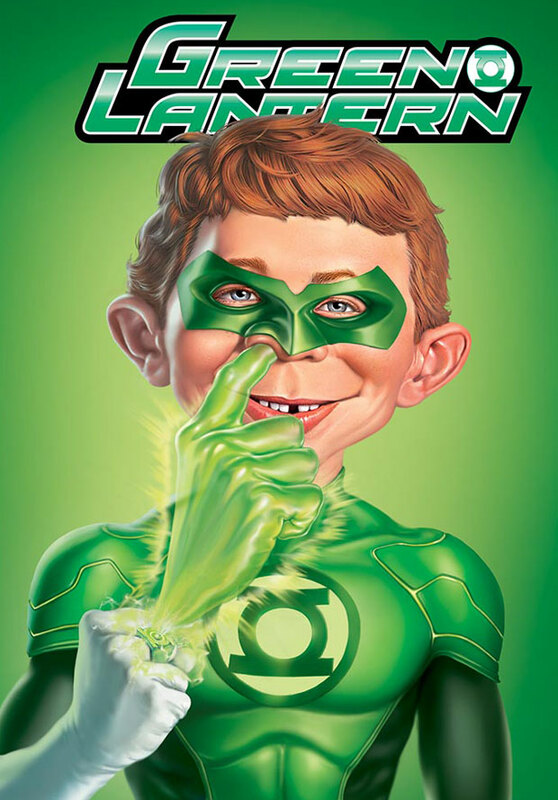 While you are either left scratching your head or enjoying the ride as the Batman “Death of the Family” story arc wrapped last week with Batman Issue #17, this new trade edition is one way to check out some other New 52 titles you might not otherwise try. And it’s fun watching how several writers can make a crossover take place in one night over 14 issues. 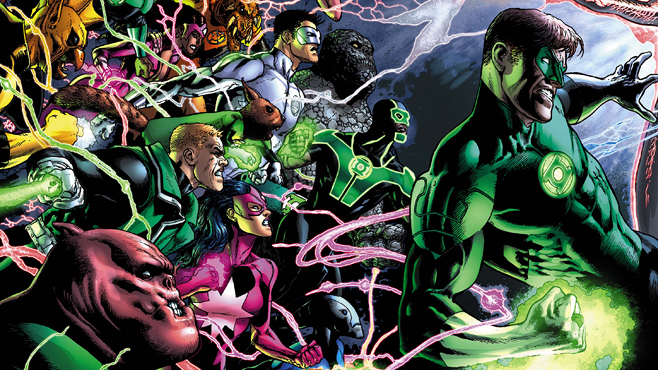 It’s the first crossover of the New 52. 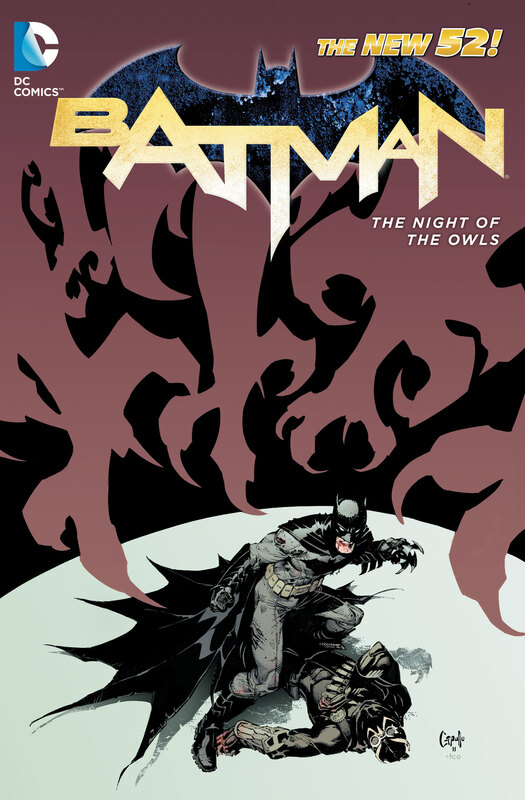 Batman: Night of the Owls collects 360 pages, including Batman Issues #8-9, plus the tie-ins from Batman Annual #1, Nightwing Issues #8-9, and Issue #9 of All-Star Western, Batgirl, Batman and Robin, Batman: The Dark Knight, Batwing, Birds of Prey, Catwoman, Detective Comics and Red Hood and the Outlaws.